This classy ring is made from Stainless Steel, which is known to look just like sterling silver but is more resistant to tarnishing and oxidation, and which releases no nickel onto or into the skin, so it is perfect for men who have an allergic reaction to sterling silver. Stainless Steel is known to be an extremely long-lasting metal and does not dull over time like sterling, and requires no maintenance. This ring measures just under 9 mm wide. 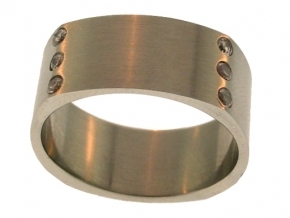 This ring has a brushed, flat finish and is a deeper tone than sterling silver. It is more of a gun-metal gray. 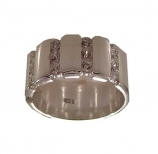 It is a simple band, with just the slightest touch of bling. Every 3/4" there is a row of 4 individually inset tiny, round stones. There are two rows of this in the front and two in back. Please note that although our drop down sizing window shows sizes 9 thru 13 for our men's rings that in most cases we only stock size 10 & 11 for immediate shipping. Other sizes shown could take a week or two to mail out, while we make it up for you. 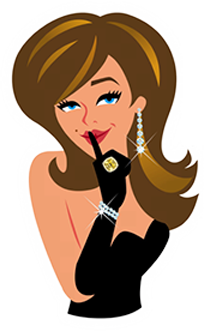 We will email you within 24 hours to let you know how fast your item will be shipping out, or feel free to call or email us with the exact name of your ring so that we can give you an approximate shipping time estimate.